The Mexico City ice rink – built by the Federal District government in the middle of the expansive Zócalo – ends another wildly successful run Jan. 7, having attracted thousands of want-to-be skaters daily to what has become unlikely winter attraction and unlikely political prop. 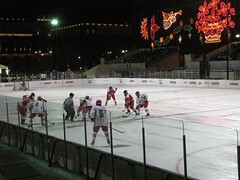 The rink debuted in 2007, thanks to Mexico City Mayor Marcelo Ebrard. He also built urban beaches and opened weekend bike baths. The opposition National Action Party (PAN) branded the ice rink and his other projects, "Bread and circuses," given the pressing problems in the Federal District with traffic, water and garbage. But the rink proved a smash hit with long lines forming in the pre-dawn hours. The reason: It's free – all the skaters and local officials say. The rink occupies a spot in the Zócalo, the most prominent landmark in the capital and a seat of power dating back to Aztec times. All politicians aim to project power from the square, says local columnist Adrián Rueda, a keen observer of D.F. politics. And in the case of Ebrard, he needed to project power in the hopes of winning the Democratic Revolution Party (PRD) presidential nomination in 2012 – something that will once again go to Andrés Manuel López Obrador. Ebrard, political observers say, came to power lacking control of the corporatist groups in the 16 boroughs – many of which were capably managed by René Bejarano (infamous for the cash-in-a-suitcase video scandal and a López Obrador affiliate) and René Arce, the Senator once part of the PRD, but now in the Green Party, who holds enormous influence over Iztapalapa. To build his own base, Ebrard turned to the "circus" – a tactic learned from his mentor, former Mexico City regent Manuel Camacho Solis. The circus (the ice rink and the such) allowed him to gain favour among the masses and, to some degree, break the power of the client groups. Unfortunately for him, it wasn't enough to win the PRD nomination this time around. I recently wrote on politics and the ice rink for the Toronto Star. Read it here. The Russians are coming ... to Mexico?